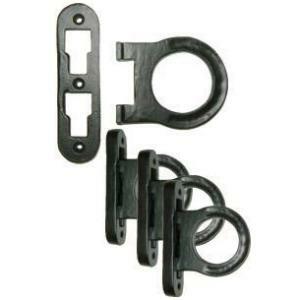 Horseshoe Bed Rail Fastener Set Plate Size: 4-9/16" High x 1-3/16" Wide. Rail Hook: 2-5/8" High x 2-11/16" Wide. Package contains four plates and four hooks. Enough to do one bed. Item ships same or next business days. This item is $17.74 when your order exceeds $250 before shipping in qualifying items.